Sixteen polycyclic aromatic hydrocarbons (PAHs) were analyzed from the surficial sediments in Erhai Lake, a plateau lake in China. The results showed that except for acenaphthylene (Ace) Ace and Dibenz(a,h)anthracene (DBA), the central region contained individual PAHs at concentrations lower than those in other lake regions. Total concentration of the PAHs (ΣPAHs) in the sediments from Erhai Lake ranged from 32.42 to 558.53 mg/kg with a mean value of 256.70 mg/kg. The maximum value of ΣPAHs was observed in the north region of the lake and more than 10-fold higher than the minimum values. Moreover, high molecular weight (HMW) PAHs, especially 5-ring PAHs, accounted for higher ratios up to 76 % relative to other PAHs compound in almost all sampling sites. Molecular diagnostic ratios including anthtacene (Ant)/(Ant + phenanthrene (Phe)), fluoranthene (Flt)/(Flt + pyrene (Pyr)), benz(a)anthracene (BaA)/(BaA + chrysene (Chr)), and indeno(1,2,3-cd)pyrene (IPY)/(IPY + benz(g,h,i)perylene (BPE)) were recorded at all sampling sites and indicated that the origin of PAHs in Erhai Lake was predominately pyrolytic. 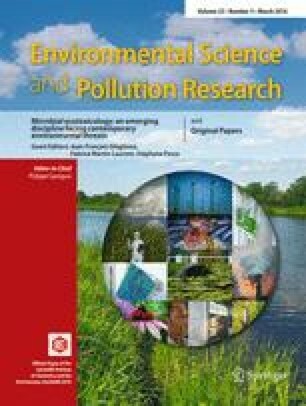 Furthermore, principal component analysis with component dominating by HMW PAHs showed that combustion origins were the primary contamination sources of PAHs in the sediments of Erhai Lake. Finally, ecological risk assessment indicated that the sediments from Erhai Lake are exposed to potential low risk for ΣPAHs, and the ecological risk decreases in the order of northern region > southern region > central region. This work was funded by National Basic Technological Research of China (2014FY110400), National Natural Science Foundation of China (no. 41271214), A Project Funded by the Priority Academic Program Development of Jiangsu Higher Education Institutions (PAPD) and State Key Laboratory of Lake Science and Environment (2014SKL014).